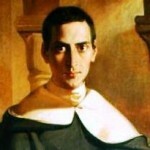 Jean-Baptiste Henri-Dominique Lacordaire was born in Recey-sur-Ource, France. He was a French political activist, journalist and preacher. He re-established the Dominican Order in post-Revolutionary France. Raised in a troubled time, he renounced religion and studied jurisprudence at Dijon, following which he practiced law in Paris. After experiencing a religious awakening, however, he studied for the priesthood and was ordained in 1827. In 1830 he joined a small group of Roman Catholic writers under the direction of one of the most controversial and influential figures then in the French church, Hugues-Félicité-Robert de Lamennais. They founded L’Avenir, a journal advocating the separation of church and state. He was head of the French Dominicans from 1850 to 1854 and helped to make the order a religious and educational power in France. He was elected to the French Academy in 1860.